There are a lot of things we take for granted today, never questioning how we got to where we are now, especially if we know history shows us a picture of the way things were that is completely different. Some of the advancements are clear and taught in schools, like the fight for civil rights or the fight for women's rights. But what about changes in the workplace? How did we end up with OSHA? Do we focus on what inspired those laws and guidelines? If we're lucky, we're taught about the outlawing of child labor and catastrophic disasters like the Triangle Shirtwaist Fire in NY in 1911. But what about longer lasting, more systemic tragedies like that documented in Kate Moore's The Radium Girls? Stories like that have long been buried despite the major role they played in changing laws and protecting the safety of vulnerable workers. This narrative history tells the story of the girls as young as eleven and young women who in the early years of the twentieth century, worked at the glamorous and reasonably well-paying job of dial painting. The women were hired on to work on the luminous dials that the government wanted for war time troops and that civilians wanted on their watch faces. Glow in the dark was all the rage and in high demand. The job was a sought after one, with the women themselves glowing in the dark from the radium that shimmered all around them. They were very precise painters, instructed to "lip, dip, paint," to moisten the fine hairs of the paintbrush in their mouths before dipping them into the radium infused paint and then carefully painting the dial. Although the radium was all around them, no one was worried what inhaling or ingesting it, as when they lipped their paintbrushes, might mean for the young women down the road, at least not until they started getting sick with inexplicable illnesses, cancers, and bone and tissue deterioration. 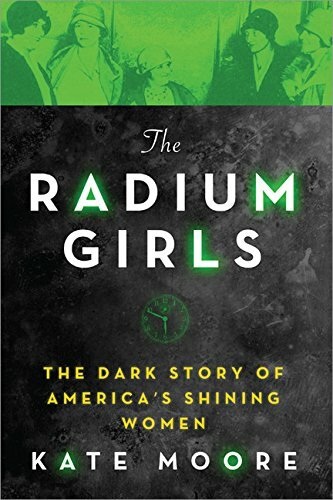 Even then the companies involved refused to admit that there was anything wrong, willfully ignoring mounting evidence of radium poisoning, treating the women as disposable, and shirking their responsibility to the slowly and painfully dying women. Only a lawsuit would begin to make any of it right and change workplace health and safety responsibilities for future generations. Moore focuses on the human cost and corporate greed that underpins this dark story. She tells the personal stories of many of the women who were afflicted, those who died, and those who fought the companies even under terminal diagnoses. The girls were from working class families, many of whom depended on the paychecks these young women brought home. They were happy, social, and so very young. Initially the girls were delighted by the "shine" of the job, enjoying the cache of their positions and the very real glow in the dark effect of being around radium all day. But then strange symptoms started to plague the dial painters and Moore describes their illnesses in horrific detail. She also detailed the emotional cost to the families and to the young women, even years after they had ceased working in the factory. Certainly no reader can remain unmoved by what these women suffered and yet because Moore chooses to tell the tales of so many, it does lessen the impact a bit. There are simply too many girls for the reader to keep straight. While this shows the breadth of the problem, it also makes for too much repetition in the book. Also, there are points where the book veered from good narrative writing to invented inner thoughts, the sort of (unacknowledged) speculation better served by a fictionalization than a straight history. After the early repetition ceases for the most part, the narrative gets bogged down and slows to a crawl with the lawsuit and court appearances feeling like a dry recitation of facts. After the personal engagement of the first two thirds of the book, this is a huge tonal disconnect. The story is an important one of workers' rights and it puts a face on these forgotten women, ravaged by radium poisoning, maligned and abandoned by the companies who hired them, but there were problems with the writing and it wasn't nearly as engaging as I would have hoped although I remain glad that we read it for book club as we did have a good and in depth discussion about the subject. Thank you for your thoughtful review. A couple of quibbles: First: My understanding is that all of what appear to be "invented interior thoughts" are based on actual letters and diaries of the girls. Second, as the son of Leonard J. Grossman, the attorney who represented Catherine Donahue, I found the last section of the book quite fascinating. But them I admit my bias.